Prototype: Two American type R-40-14 refrigerator cars. 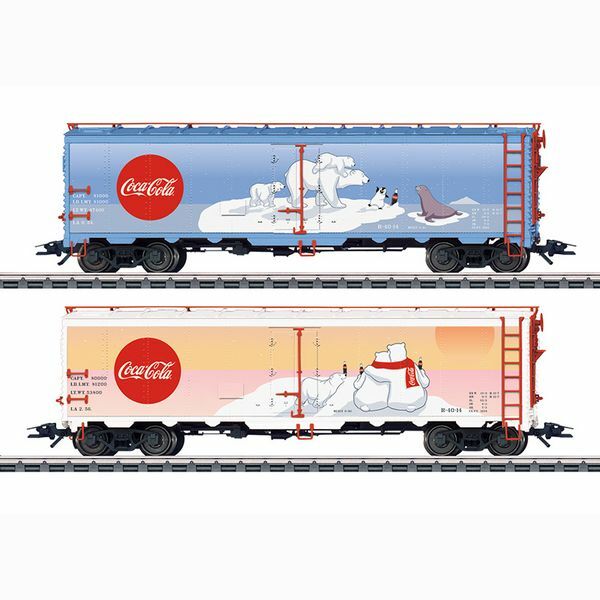 Unique paint and lettering scheme in the Coca Cola® design. Model: Each car has different lettering and a unique, custom paint scheme. The car frames and floors are constructed of metal. The trucks are detailed and have special wheel sets. The cars have separately applied roof catwalks and ladders, brake equipment and other details. The couplers can be replaced by other types. Total length over the couplers approximately 31.2 cm / 12-1/4". DC wheelsets E320552 (NEM), E320389 (RP25). One-time series in a Coca Cola® design.